The incident dates back to February 9, 2013, according to a report by the New York Daily News, when Kevin Dennis-Palmer Sr. was put in a chokehold and attacked by police officers after he attempted to park his car near his home. The lawsuit was filed one month before African American man Eric Garner died after being placed in a chokehold by a New York Police Department officer in Staten Island. That incident drew nationwide attention to law enforcement’s use of the chokehold, which is banned by the NYPD. In Dennis-Palmer’s case, police reportedly pulled up in their cruiser and asked for his license and registration. In response, Dennis-Palmer said that he had not done anything wrong, questioned why he was being stopped, and started recording the incident on his cell phone. At this point, police knocked the phone out of his hand, maced him and tried to drag him out of the car. Dennis-Palmer, who is 6 feet 3 inches tall, told police he was stuck before at least eight other police officers arrived and tried to pull him out of the window. Eventually he was grabbed, turned around and forced face-down onto the ground, when one officer tries to pick him up by the neck. “I’m yelling, ‘I can’t breathe – you’re choking me! Just put the handcuffs on! I can’t breathe! I can’t breathe,” Dennis-Palmer said he told police, according to the Daily News. Dennis-Palmer was later taken to the 75 Precinct stationhouse in Brooklyn and booked for resisting arrest, obstructing governmental administration, disorderly conduct and having windows that were too dark on his car. After being released he went to a hospital for treatment for a knot on his temple, a swollen eye and cuts to his wrist and his head. Criminal charges were ultimately dismissed against Dennis-Palmer. The NYPD’s Internal Affairs Bureau investigated the incident, but the outcome of the probe has not been disclosed. A judge in a Manhattan federal court approved the settlement last week. His lawyer, Jeffrey Rothman, said that even though the city and NYPD did not admit wrongdoing, the settlement and the case are both important. “No one suit is what forces change. It’s the accumulation of them that fosters public awareness … and the public’s demand for accountability,” Rothman told the Daily News. Earlier this month, the NYPD’s inspector general issued a critical report – commissioned in the wake of the Garner death – that found in 10 recent cases involving chokeholds, cops received little or no discipline from superiors. Those 10 cases were referred by the Civilian Complaint Review Board and were also revealed in a report released in September, one that showed there had been 1,128 cases of chokehold allegations over five and half years. 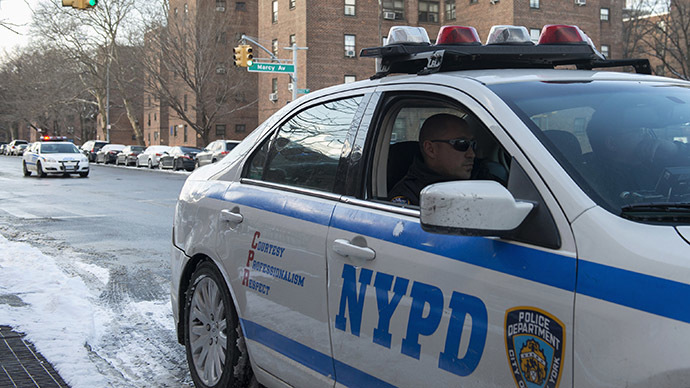 Among the report’s findings, half the officers in the complaints had history of six or more CCRB complaints, with 25 percent of officers having a history of 10 or more complaints. Another finding was that the East New York, Brooklyn’s 75th Precinct logged the most chokehold complaints – 65, followed by 73 Precinct at 52. For 20 years, the NYPD Patrol Guide has prohibited police from applying a chokehold or any pressure to the neck that may inhibit breathing.